The High Performance Totebin 41, specifically designed for transport and storage of instant frozen foods (IQF= Individually Quick Frozen) is now available in Europe. To serve your American customers with the right packaging we can deliver your HPT 41 straight from stock, with or without cornerposts and liners. HPT41 is standard in the USA for packing free-flowing frozen food. Each tote can contain up to 700 Kg and can be stacked even 7 up depending upon weight (using inserted cornerposts). With this incredible compression strength, the HPT 41 meets the high American specifications. HPT 41 is generally used as packaging for frozen IQF vegetables and fruit. Also frozen meat or pasta can easily be stored and transported in a HPT41. 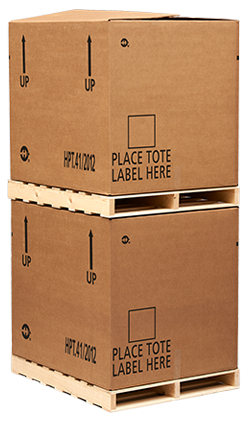 The High Performance Totebin is made of multiple layer corrugated cardboard, all layers laminated together with water resistant adhesive to yield a compression strength of ~7.200 Kilograms. 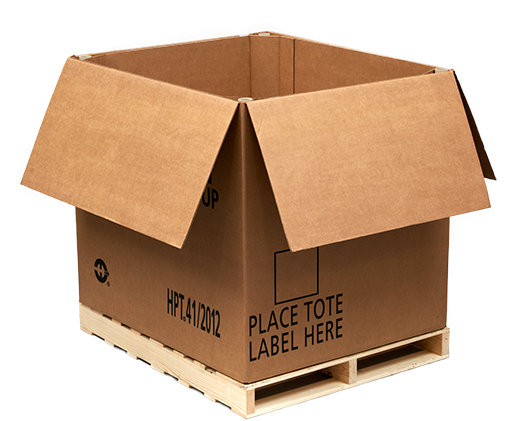 It is used either on pallets or slip sheets. Please contact us on info@ramakers.nl or call us on + 31 13 504 26 36 for further information, references or a price offer.